It's a busy day at the White House for both the president and vice president. At 1:30 p.m. ET, President Obama will announce his pick of current White House Chief of Staff Jack Lew to lead the Treasury Department. If confirmed by the Senate, he will replace current Treasury Secretary Tim Geithner, who has said he would like to leave by Inauguration Day. The Treasury pick follows Obama's recent nominations of John Kerry to lead the State Department, Chuck Hagel to lead Defense, and John Brennan to head up the CIA. More high-level announcements remain, including those to fill vacancies at the top of the Department of Labor, Department of Commerce, and the Environmental Protection Agency. Meanwhile, Vice President Biden continues his so-called listening tour Thursday on the issue of gun control, set to meet separately today with hunting enthusiasts, gun owners, and media and entertainment executives. Kinda funny, Obam picked repubs for the two most important jobs, in gov, i guess his prior picks couldnt get it done. When is job creation going to start?? When is Ben Ghazi going to be revealed??? Sec Clinton is still on tap to testify about Benghazi. I guess we'll find out at that time! That GOP pick a similar world view as Obama does! Who is the other GOP pick? I just know of Hagel. Brennan for CIA, I read his bio, pretty much a right winger, kinda scary, but honestly you need an extreme person in that position. I think he should nominate Harrison Ford. He is not a CIA director, but he did play one on TV. With his expanded drome use program, Brennan can be considered a hawk. Both picks are not without controversy. The gay community and GOP has issues with Hagel and Brennan has his drones! All I know is the hearings will be "must see TV". There's a lot of agitation among Democrats and the media about the new Obama Cabinet's lack of diversity. Perhaps the President should have reached for Mitt Romney's 'binders full of women' which was made fun of so much during the elections. Oh the irony. Harrison Ford for CIA, not too shabby. Personally, I would have picked Sheila Bair for Treasury over Jack Lew. At the very least, her signature may not be such a mess. December, I read about the reaction to the lack of diversity too! Almost all of the complaints I'm reading is dealing with gender and not race! Interesting dynamic! I don't think the President will be able to choose anyone without controversy. But, that is the nature of things. Sheila Bair for Treasury? She may be worth consideration. It will be bloody difficult to pick someone who doesn't disagree with one side or the other no matter how qualified they are. Far too often politics trumps the best interests of the country! Steveo, That fact is more true today then ever before. It is also the reason there is such division between the two parties. OWN –WHAT IS IT THAT WE DON'T KNOW.---WHO WAS RESPONSIBLE FOR THE DEATHS OF AMERICANS IN THE SERVICE OF OUR PEOPLE THE DIPLOMATIC SERVICE. Brenner is not necessarily GOP he was the daily intelligence briefer for President Clinton. In 1996, he was the CIA chief in Riyadh, Saudi Arabia. Generally he could be classified as a career CIA employee, who has been working for the CIA for 25 years through several administrations. START OVER AS IT WAS IN THE BEGINING WITH AMERICANS RUNNING THE SHOW. JUST A THOUGHT FOLKS. the fact that 42% of the presidents top people are women seems to elude most people. Rice would have been good but got shot down before she even started and if the worst thing about loo is his signature then get a life. I thought this was based on performance??? What's the difference the gender? Alexrod said she was never up for serious consideration. Who is Alexrod, and why should we listen to whoever that is? Jean, are you being sarcastic because of spelling or do you really not know who Axelrod is? Who knows what the truth is? Axelrod, as we know, will say anything that hedges his bets so she may have been considered but once it was clear that there would be flack they simply ditched the choice and then claimed it was never "a real consideration" anyway. Politics 101: Never admit what can't be proved. Caramon I know who David Axelrod is...Alexrod no...maybe Nam is off his meds, or he is dyslexic. actually I think he probably has never had the benefit of drugs to cure what ails him. Maybe I wasn't being nice...sorrry.....dyslexia is not fun...my sister grew up with it in an age when it wasn't even diagnosed. I pretty much thought so Jean. I would have been shocked if you didn't know who Axelrod was. You realize that we are just repeating what is being reported, right? That 42%, you mention, is that the numbers from the 1st term or 2nd? We are addressing nominations for term #2. No one here addressed Lew's signature. Several news organizations did. AND as December stated, the DEMS are not happy with the lack of diversity! So I imagine that "get a life" remark is addressed to the Dems? I had MSNBC on this morning and I thought Mika was going to have a fit about this, but Joe kept egging her on. They also mentioned that Lew might redo his signature since it looks like a slinkie. Lew's signature is unique! The scary part is I've seem more legible signatures on prescriptions! Welcome back Judy. Glad to see you decided not to boycott. I agree that the most qualified people should fill the top positions. Unfortunately, not everyone agrees with that. Some people believe that positions filled mostly by men typically show gender bias. It is something many feminist believe. I do agree with workplace equality. But what some believe to be equal others do not. And, of course, the media love a good controversy. Frankly as a woman I want the most qualified person in the job regardless of gender. Just like I feel President Obama is the best person qualified for the job, in a comparison to McCain or Romney. . Worthless men? Hate to break it to you but "it's a man's world" was just a song! AN ADMINISTRATION EQUAL TO WHAT WE ACCOMPLISHED. THAT IS THE DIFFERENCE BETWEEN THE PRIVATE SECTOR AND SO CALLED GOVERNMENT. RICE HAS HAD ABOUT AS LITTLE EXPERIENCE AS OBAMA–HE DOES NOT KNOW JACK SHEIT AND SHE HAS LESS. TELL ME OTHERWISE. TELL ME THAT JUDY-–WHY ARE YOU STILL HERE.-NO BALLS IN THE MAN AREA? They should have titled this "Thursday at the WH", they were on a roll. THERE BUSSINESS. HE JUST IS NOT QUALIFIED TO HOLD A REAL JOB. HE DOES NOT QUALIFY FOR ANY OF THOSE. Those who criticize the cost of Obama’s Christmas vacation don’t want you to know that George W. Bush spent at least $20 million taxpayer dollars just on flights to his ranch in Crawford. The right wing has been outraged at the four million dollar plus price tag for Obama’s family Christmas vacation, and they constantly hold George W. Bush up as an example of how thrifty a president should be when going on vacation. The problem is that W. was not thrifty. He was the most expensive vacation president in US history. Not only did Bush spend more days on vacation than any other president, but he used Air Force One more often while on vacation than any other president. Plus, consider his permanent campaign which started in 2001 for his second term. Not withstanding vacations and wars. Bush was not the fiscal conservative he was pumped up to be. At the same time and for the most part, presidential vacations are often working vacations since this is a job that requires attention pretty much 24/7! So, in short I am in agreement with you. AF-1 is a perk of the job! Yes, it is expensive but it comes with the job. Let's all put this issue to bed and take on the next one! (The last staement is directed towards those who are having difficulty moving on from this). The country wasnt in the debt shape with Bush that it is now, raising Taxes and going on a 20mil is just an insult to working people, talk about lack of respec.t remember this guy is suppose to work for us not waste our money, financally his admin has just been an embarassment, look into his gren jobs, before you you tell me how great he is, no business experience and it shows. I understand that but what we have is current debt piling up on top of previous debt. It will take serious leadership to break the cycle. Honestly, NO ONE seems to be willing to make the really hard decisons! Just look at the backlash McConnell is getting for even SITTING at the same table as Biden! We voters are a fickle bunch. Jean, at least in part we agree. With so many serious issues facing the country, the amount of vacation time the President takes is not very important. Personally, I think it was fine for President Obama to take a vacation with his wife and daughters as well as return for the fiscal cliff discussions. However, some of the expensive trips some of the employees of federal departments take, particularly with a video poking fun at the tax payer, is by far more serious. This sounds like the same argument my 6 year old would use. So and so did it therefore I should be able to do it too. Two wrongs don't make a right. No Kool-Aid it a bundle discourse of what is being pumped out each day in the worthless, and useless gripes from people like you. Maybe you should gripe about something logical and factual not some constant lame whine. Nam: Once a year round trip to Hawaii for 8 years, in caparison to 77 round trips to the Crawford Ranch during 8 years ...you figure it out. I'm a retired bookkeeper. OB SERVED AS A COMMUNITY ORGANIZER AND THAT WAS TO ELITEND THOSE FOLKS HOW TO SCAM THE SYSTEM AND PUT DOLLARS IN THEIR POCKETS AT THE EXPENSE OF HARD WORKING FOLKS NO WORK AND GET A CHECK. RIGHT MIND AS A TAXPAYER COULD WRAP THEIR HEADS AROUND SUCH A CHICAGO DEAL. President Obama also served 12 years as a State of Illinois State Senator for the 13th District, 4 years as an United States Senator served on the Foreign Relations, Veterans Affairs, Environment and Public Works,Homeland Security and several other committees while in the Senate , taught Constitutional Law for 12 years at the University of Illinois, was the first black president of the Harvard Law Review, served on the board of several non-profit organizations, worked as a civil rights attorney, was a community organizer, and has written 6 books. Being a community organizer should be in the resume of all Presidents. Now, explain to me other than showing your complete lack of education....what worthwhile endeavor have you taken on that qualifies you to belly-ache all the time? All well and good but right now the U.S. needs to move forward not stagnate, the only reason Mitty was a choice was he can generate an economy, all Bammy did was fine, but he is not capable of producing an economy. He is very good at spending. The gun control, ben ghazi, cabinet picks are just a smoke screen for ineptness of business sense. Why is criticizing Obama considered to be "bellyaching" while criticizing Bush is not? I don't recall anyone accusing you of "belly-aching" when you criticize Bush! Why must I repeat this for the umpteenth time.....If you will check many sources the federal government is:NOT A BUSINESS. Why so many fools are under the deluded impression a service set up by the framers to meet the needs of American citizens is a business is beyond reason, a democratically run government is not set up to make a profit its primary function is to serve the needs of citizens. Even Ron Paul whom I rarely agree with had the good sense to state: "The Government is not a business".- Ron Paul 10-17-2011. KNOW AS MOST OF ALL THE OTHERS THAT READ THE COMMENTS. If things aren't questioned or challenged then nothing changes. So,...you are using your employer's computer wasting time until lunch?? What a guy. Here is what I have to offer the USA, if I can get help, the help I need is someone to arrest my husband for theft, sounds odd, but I guarantee on the biggest stack of bibles one can make all the way to the good Lord, the US will come up with more – 1.) Homes for people that have been put through disaster, 2) Banks to run the USA, not ran by the Feds, 3) Gov buildings turned in to tourist museums to help each state, 4) No Taxes, Cesar was the founder of this, Obama will be the destroyer of this, 5) a Prison in IL, waiting for 1,000 of Gov employees that have or no of theft through the Gov. 6) Food Cards a thing of the Past, Churches to be furnished food, and feed the elderly and homeless free, 7) Food Banks to close, and lower prices in Grocery stores, 8) Disability to those who need 9) Payback for those who bought it 10) Business to be turned back to the USA, Foreigners to be shipped away 11) All passports to have ID and finger print (Amsterdam is the only place that gives out cards with no ID and Finger Print) seen them, not good, All so called Dr's Foreign and not, to go against the toughest board the USA will have. That will weed out a lot of Foreigner's that get their info off the internet, and are not even a Dr. I have all this with the Good Lord to offer the USA, if they just go and arrest my husband Jame Fisher, 2 Atty. Mr James Bruhn, and Mr. Drew Chambers, 2 Judges, Judge Pelton, and Mary Howes, and from the State of Iowa Government office retired Gov. Culver, who hired in 2009 the three Mr. Forneys to do investigation, Me my 5 deleted bank accounts at 1st Gateway Credit Union in Camanche IA would be Mr. James Forney, For my Canadian friend our Gov put in prison after a long fight for her rights and mine that was a year and a half out – Mr. Douglas Forney, and reporter to News – Doug Forney, all three Gov Culver in Iowa created, one man to take down helpless woman for their greed. They may have power in the USA, but they do not have and will never have the Power of the Good Lord. I have fought this and they have put me in a homeless shelter, after 34 years of marriage, knowing my husband moved out and was with another women, they offered him every thing, house, car, and me 2 bags of luggage and the homeless shelter. This has destroyed my family, that would be my 2 daughters and 3 grandchildren that seen their mom walking down a highway with her luggage, tears non stop. This has been a long fight in Iowa 8 years as of 2/08/07, my friend they accused of stealing 1.5 mil, and their is a lawsuit towards the US that will be coming from Canada, For that is where she and I have been working with also her dad and mom, for they have my info and hers. She wants out of prison, I want out of the shelter, but the Lord wants a New World, if you have not seen what he has been doing, please stop and look around, The Lords list is long, I have been with him all the way tho, threw many phone calls and offices he heard everything, So please think this over, For there is so many people involved in this theft I am sure when the banks are froze, we will have enough to rebuild America, for this is truly the way it should be. Not people trying to make something out of nothing, for remember, life is about Love and Words, everyone has some to learn Dr's, Lawyers, Policeman, and the list goes on, the way all this started is when Camanche Police and Credit Union, FBI, ALL Gov Offices, States offices, u name it I have become very "Street Smart", and have Learned all the way from 6 months in a shelter in Clinton Iowa, that there is a major story to be told, and a movie will unfold, that's when we will see the villages 3 per state start to develop, with health care one will afford with out INS., Please can some one help this grandma reconstruct the US, We are bosses over Gov offices, it is simple, we stop payroll, freeze all bank accounts, we need workers to get this type of job done, physical workers, not lets vote on this. President Obama is the one that will push this button, I have 8 years, and over 1,000 documents, I would say that should be enough to cash in on a few people to be put in court. They will put the others in, for they will not leave anyone behind, for there is no court trials, nope, what they have done they lost that right unless they can find someone to help them, like I have had to, for they will not give me a fare trial at all. No, I have had to be my own atty.. Like I said a story, a Whole New World, Think and pass this own, there has to be someone! Bless you All For Reading! Holy Shamolely! And this relates to the President's cabinet picks.... How? I think you wondered on to the wrong site. Please get adictionary and look up the def of business, stating what other people say DOES not make it a truth. A. you can be employed by the goverment=Business= they are deducting taxes=giving benefits (too many)= pretty much falls under the def of business. Is there no common sense anymore??? As far as rand i thought you hated all repubs??? convienant isnt it to flip and flip like bammy ???? Moose get a Civics book and look up the function of government and economics....government is not set up to be a business. Yes, it hires people to do jobs....but those job are to make government and the economy work and function for the benefit of citizens ...more in the line of the structure of a non-profit organization. Maybe: Civics: Government and Economics in Action. Moose, she said RON Paul not Rand. Ron Paul was an Independent before becoming a Republican to run for President- a flip-flip for his own benefit in your words. Jean uses paragraphs, periods, capital letters, commas, and stops for a breath. Is anyone looking into whether Obama's real father is Frank Marshall Davis? You might want to watch "Dreams From My REAL Father" because there is some compelling and disturbing information in this video! 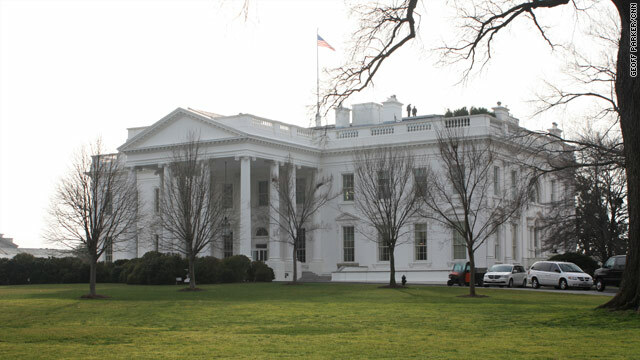 The picture shows two men on the roof of the White House. One of them is probably Obama smoking his cigarettes. It looks like two people addressing a group of people....maybe they will be putting back on Jimmy Carter's solar roof. we will still have the other fraud...Kerry as state. But then the left seem to always pick morons for this post. Wonder why? I didn't think Hillary was an idiot. But I'm sure she's resting up for 2016 if she decides to run.